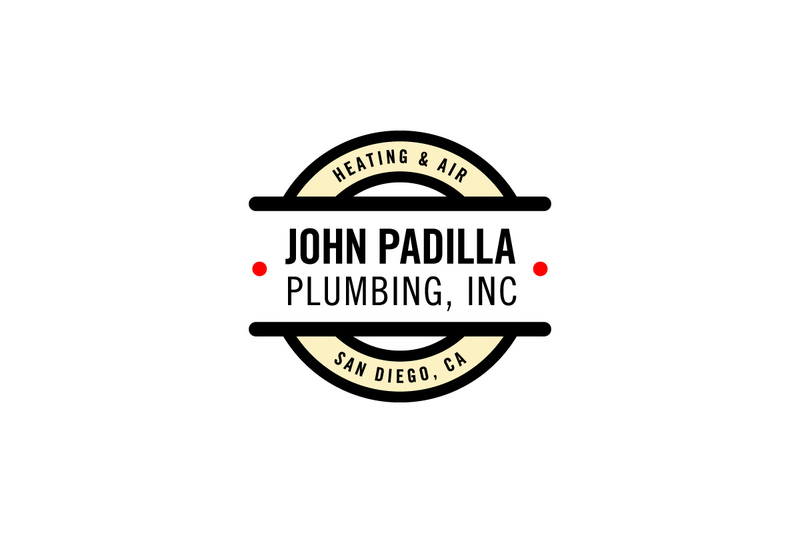 John Padilla Plumbing, Heating, & Air is a full service plumbing and repair company that serves all of San Diego County. Brand and identity design included creation of the logo, typeface standardization, business cards, and exterior design of their fleet of trucks and vans. When initially consulting with John and Johnnie Padilla, they emphasized the need for a typographic logo that highlighted the company name, and was meanwhile simple and driven by professionalism. We knew the company’s primary avenue of brand visibility was going to be their trucks, vans, and occasional advertising. 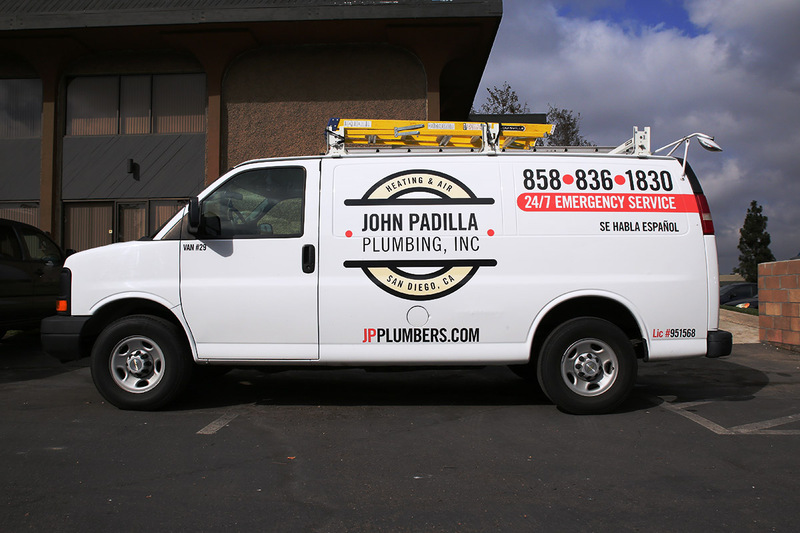 Considering the exteriors of plumbing vehicles were usually an eyesore of mottos, plumbing verbiage, and cartoon illustrations, we identified the trucks and vans as the most visible and immediate opportunity to present John Padilla Plumbing as being a cut above competitors. 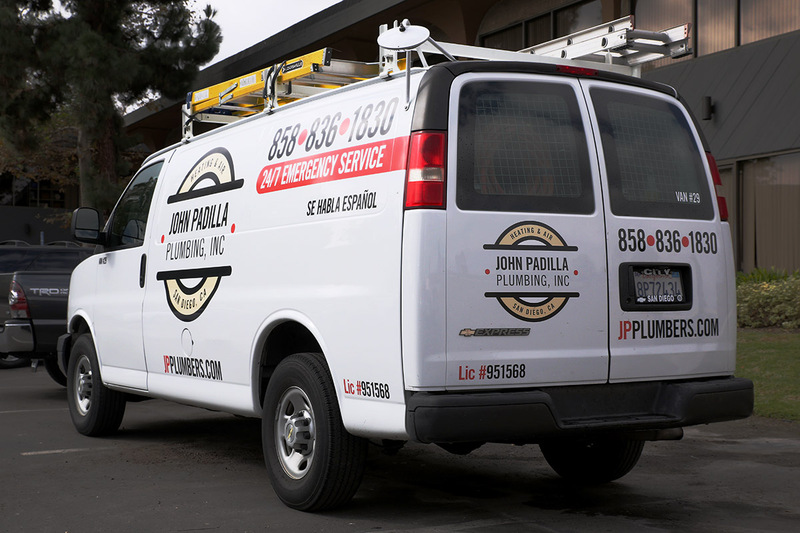 John Padilla Plumbing Inc. sought to represent punctuality, efficiency, and inconveniencing the customer as little as absolutely possible; whereas competitors where emphasizing their personalities as much or more than their service. We proceeded by developing a simple logo and identity that could be easily read on a moving vehicle, was aesthetically different from their competitors, and that meanwhile suggested professionalism and workmanship. When designing their vans we advised not to spell-out every service they offer on the vehicle, but instead: 1. emphasize the company mark and primary services, 2. the pieces of information a customer needs to know in order to initiate contact or learn more, 3. one or two selling propositions max. Considering that moving vehicles are not the best medium to review detailed information, and most people don’t know the exact tool or service they need in the event of a plumbing issue, we believed it made much more sense to keep the information concise and overall presentation professional. This was our first vehicle design, and we’re honored it was for our good friends in the Padilla family. Client: John Padilla Plumbing Inc.